Latest uploaded archive is Chronometer. Click column title to sort content. Old friend Highlander had the chance to give DrumBox a try. Here is the result. Nothing fancy, just a little video showing it in action with his electronic battery. Almost three years since I updated this page here... Damn. I feel I did that not that long ago. Anyway. A long time ago, about 30 years in fact, I wanted to write some beatbox program, some kind of specialized sequencer for drums like the mighty Roland TR 808 for example. This kind of application is in fact pretty simple to create. It took me about 3h to craft a crude General Midi enabled sequencer sending MIDI events on channel 10. My Yamaha YPT-220, a somewhat ordinary General MIDI keyboard, has happily outputed some sound with this little tool this morning. I have the joy to share a screenshot of that little tool. This tool is still largely in WIP (Work In Progress) state. It has no settings, can't select the MIDI node, can't select the MIDI channel to use, etc etc etc. On the screenshot, you'll see MidiPatch tool on the top right. This little handy tool shows applications making use of camd.libary. Play/Stop feature, it actually plays all the time! MorphOS is far from being a decent DAW (Digital Audio Workstation) but some progress has been made with the 3.10 release: camd.library for MIDI applications and support for isochronous USB devices like audio card. Those two system components open new horizons on the DAW territory even if MorphOS lacks the most basic applications. As a side note, there is a SMF (infamous .mid files) player bundled with latest MorphOS 3.10 ISO located in the C: assign under a well choosen name: PlayMIDI. SoundBankster is still alive. I did a twit some days ago with a screenshot. It wouldn't be fair to not share this bit of information here. Finally, this place is way more private if you're used to come by here to see if something is new. And that's finally what's making this place really worthy in the end. Some kind of dead end like SoundBankster is. A full rewrite has been started about one year ago to get ride of some braindead design choices I did. I'll demo that very soon in some french party (and also MIDI support). This version fixes previous SoundBankster. Beat detection is now working as expected... 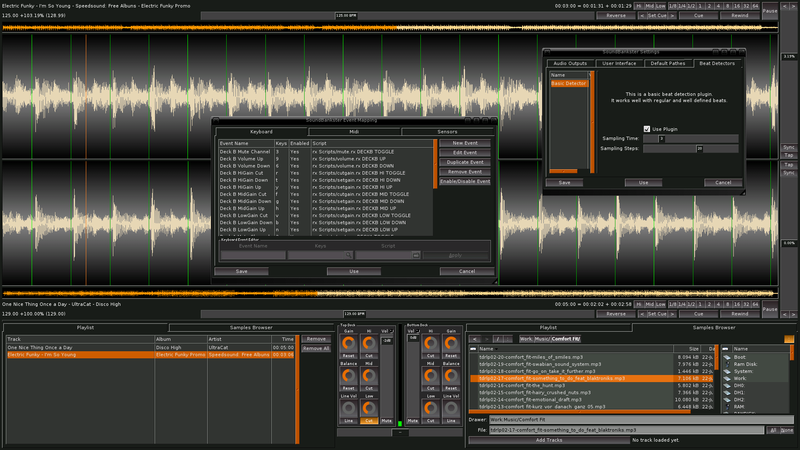 Many features have been fixed like track syncing or cue point handling. Some improvements have also been made on the user interface part. SoundBankster, an audio mixing application for DJ enthusiast is available for immediate download here. A more detailed list of changes is available in History file in archive. Before downloading, take a look at this new screenshot. SoundBankster is the fruit of many years of research and development and is freely available for use under the BY-NC-ND/4.0 International Creative Common licence. Some really nasty 'invisible' by default bug has been shipped with the 1.1 release of SoundBankster. This bug does a read at address 0 and can be harmful to the system. Update ASAP with the new 1.2 archive. My apologises for the inconvenience. SoundBankster takes advantage of many native and exclusive components of the operating system like the new HID sensors API provided with the 3.6 release of MorphOS. The HID sensors API allows many USB devices like DJ decks to directly drive the application. 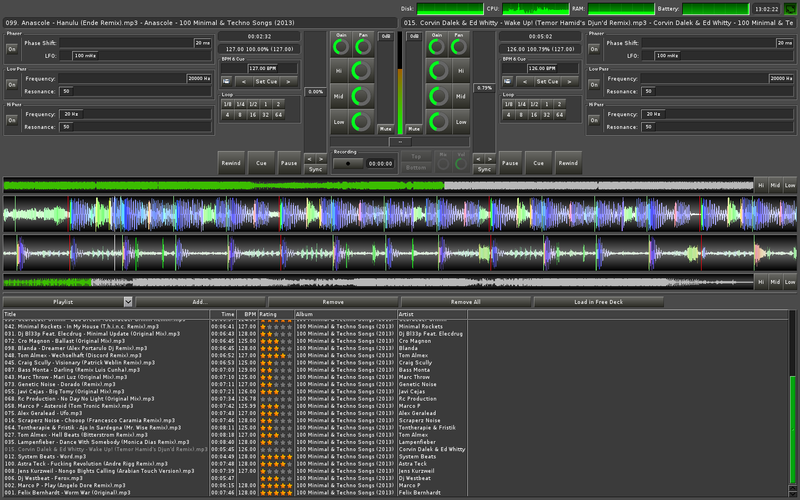 An internal event mapping editor is provided for easy wiring of the DJ deck controller to the user interface components of SoundBankster. Another native and exclusive MorphOS component, Reggae is used to load and play audio. Its efficient design allows stutterless playback even under the worst load conditions 1. With a short 20 ms audio buffer and events flowing from Sensors API every 15ms, all audio effects are applied realtime with absolutely no lag. Dual audio output is also possible via AHI units allowing headphone monitoring. This feature is only available for system with two audio outputs. 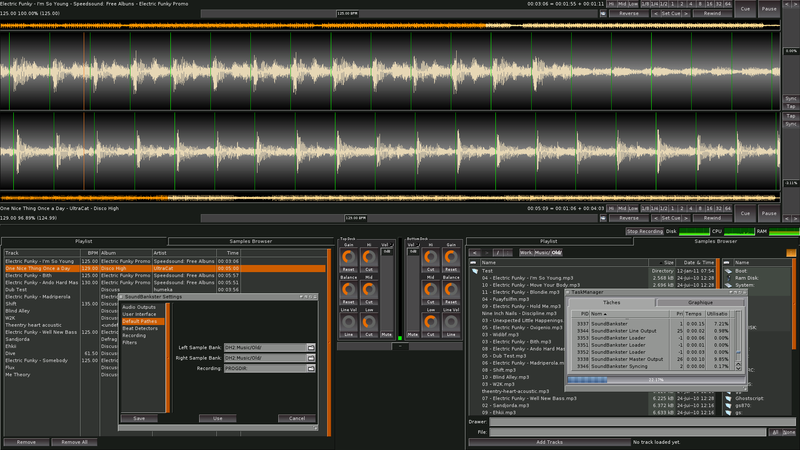 TinyGL, another native MorphOS components is used for the audio waveform rendering. If the system doesn't support 3D or lacks the resources needed, an optimised software fallback is provided. SoundBankster needs nice chunk of available RAM to work. It is advised to run SoundBankster with system equiped with at least 512MB ram. 2 Some USB device needs dedicated driver for best use. User interface is one of most important part of any application. SoundBankster is no exception to this mantra. Huge change has been made to the previous layout of the interface. And here is the result. Another 'big' thing done is the waveform rendering which is done with OpenGL instead of traditional CPU rendering. If the harwdware doesn't support 3D, software rendering fallback is still provided. And all this packed in a compressed binary of about 100KB. Things are progressing well with SoundBankster. Quite a few weeks without posting some news on the matter. But here is! The changelog as usual is big so I'll sum up only the major changes. Complete rewrite of the streching routine going from 200 lines to 20 lines or so. Also this new routine has a greater accuracy, rounding error is propagated allowing the 0.01% accuracy offered by the pitch slider. Filters! Three filters are bundled now. Phaser, Low pass and Hi pass. Still WIP but working. API is closed for now. Splited file recording. SoundBankster records in WAVE format and splits file when size exceed a predefined value. This allows 'unlimited' time recording. Colored waveform based on the frequency content. See screenshot. And as usual, tons of bugfix and minor improvements. After randomly reading autodocs (I was really bored at this very moment...), I found the correct way for doing things with HotBorder. It was a 30 minutes job to update HotBorder and update the archive accordingly. All HotBorder users are warmly invited to update their system with this new version of HotBorder which is a magnitude less hackish. Trust me. I swear. HotBorder <= 1.2 is a real little dirty hack (shame on me). 10-03-2014 March? Yes. Already in March. SoundBankster is back on my TODO list this month. So far, some rework of the main mixing routine has been undertaken. The simple (A+B)/2 mixing routine has been replaced with a more efficient one that gives much better results. Still a lot to do before a public release but I found the time to setup a temporary webpage for this special project. Jump in!. If you're used to play music in parties, you can apply to the betatester program: drop me an email for instructions. For already registered betatesters, please download latest release and give feedback! A single supported format for recording is supported right now: WAVE. To conclude this post, let's add a screenshot to show all this in action. SoundBankster is now 295KB of pure binary fatness. Still fitting a 880K floppy! A quick fix release for HotCorner. Removed an useless object that slipped in 1.2 release. A little test case for embedding Font Awesome inside a MUI class. Here is a screenshot of all the icon set. Font Awesome is a commonly used font for web application. It features more than 350 icons embedded in a standard TTF file. It is also available as SVG, OTF, WOFF and EOT file format. So far, SoundBankster was a 'mouse' only driven application. With the introduction of Arexx commands to the feature set, automation capabilities have been added opening a whole new world. Currently, the available	command set is pretty scarce and covers mostly the mixer block (equalizer knobs, volume sliders, cut & mute button...). A bunch of Arexx commands is missing and must be added. This is a tedious task and will be done bit by bit. Notice that Lua can also be used in place of Arexx scripting to drive SoundBankster. Scripting is nice but another main feature is mandatory for this kind of application: event mapping. Event mapping is simply binding a key to a function. The key can be an ordinary keyboard, a MIDI packet or something comming from an USB controller like a mixer. So the big deal is to wire a key throwing an event to some function of the application. Bonus: make this configurable at will. 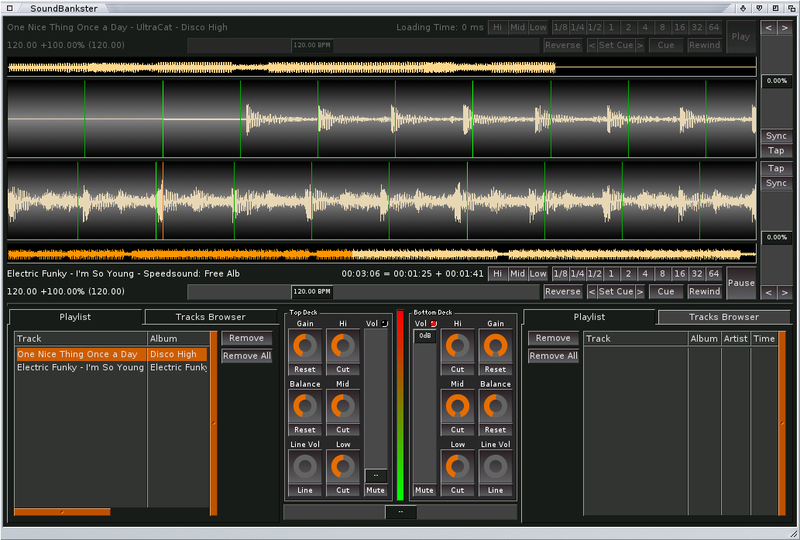 SoundBankster features an Event Mapping Editor that currently addresses the (ordinary) keyboard. 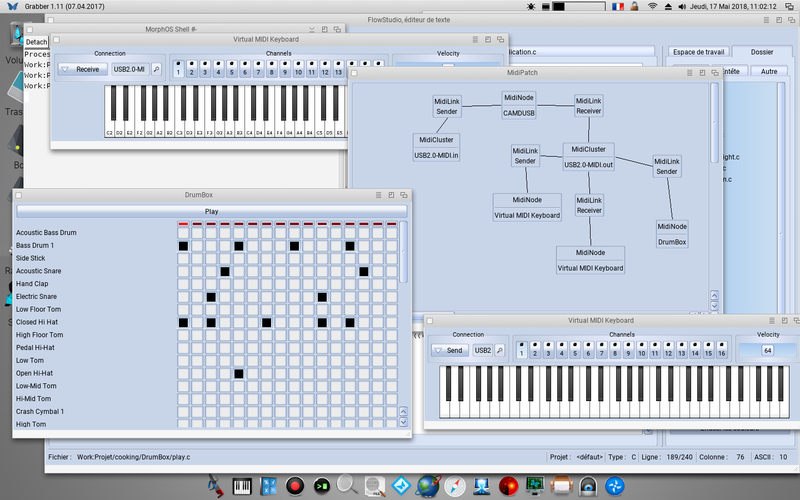 At a later stage (when some MorphOS components will be available...), MIDI events and USB controllers will be added. Some placeholder have already been added to hold this. The principle of the event mapping is pretty simple for keyboard. A keyboard shortcut runs an Arexx script which in turns drive the application. Here's a link to some videos showing SoundBankster in action. Last week end, SoundBankster was used in some australian party. I don't have yet anything to show about this party but the DJ who used my software might upload some picture/video footage of this event. And to keep you entertained, here is another screenshot (oh no... not again!). Just a quick screenshot showing the internal custom knob replacing the old and mighty MUI knob. This custom object has internal imagery but will also be able to fetch some knob images elsewhere for user customization. SoundBankster project has made a giant leap forward today. 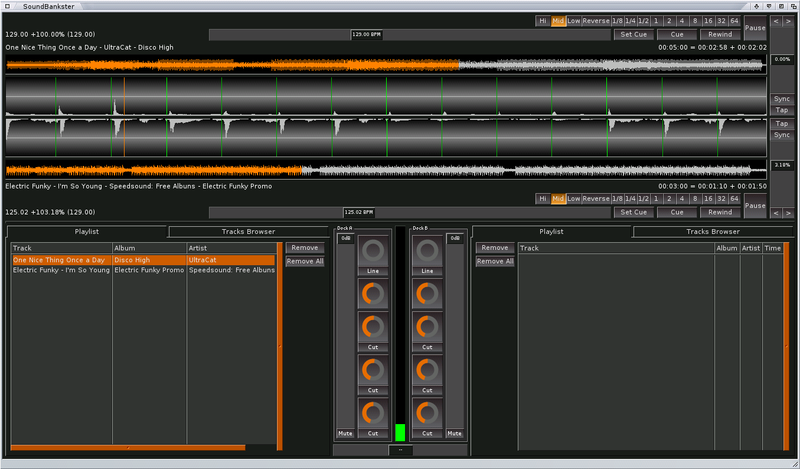 It now features a plugin system for beat detection and audio filters. The API is still closed for now but will be open at later stage. Adding audio filters or beat detection is just adding an external MUI class to the application. Main window will shows all available audio filters. Improving beat per minute (BPM) detection will be either adding a better beat detection plugin or replacing the previous one. 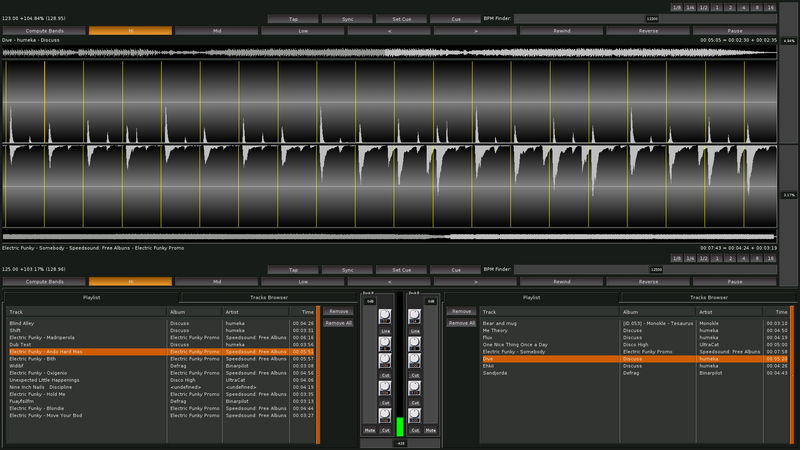 If you're interested with DJ-ing software, come to #morphos on IRC freenode network and have a chat. 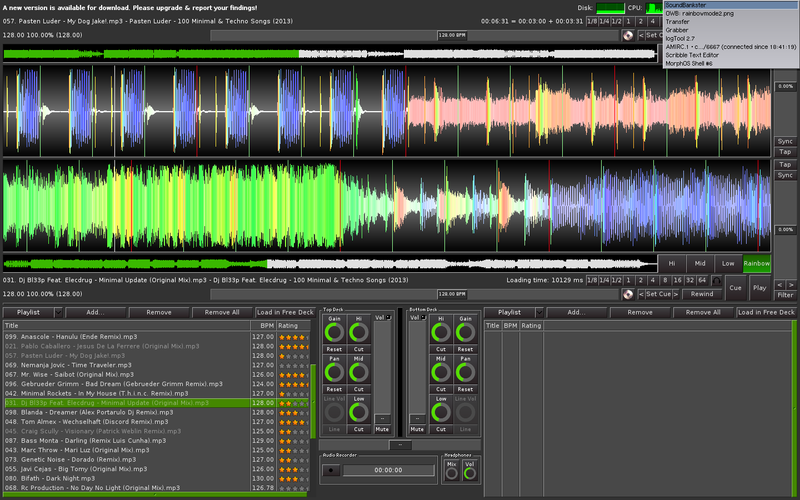 Even more work has been put in SoundBankster project and here is another screenshot showing all the new features. Both decks have been loaded with the Hi/Mid/Low RMS power computation switched on. Samples have been synced using the Hi RMS power band. 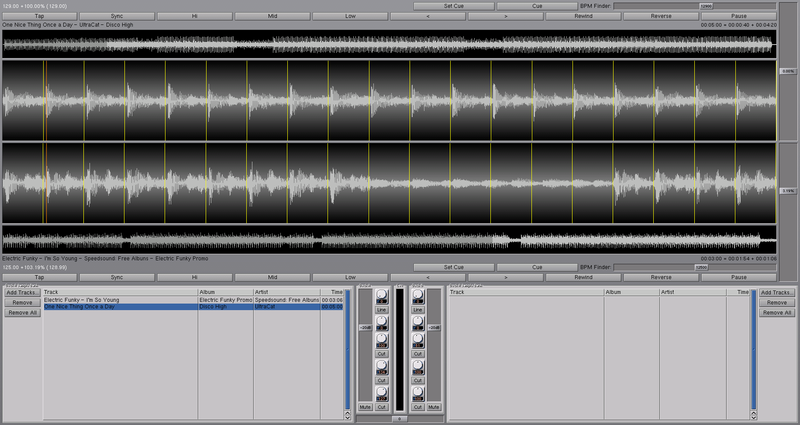 Sometimes, the sample waveform looks like white noise and no visual information can be used to sync tracks. Here comes in play the Hi/Mid/Low RMS power display feature. Using the information contained in each frequency band, visual syncing is made easier. Thanks to the power of MUI, a darker skin has been configured which is more suitable for night vision. Some work has been done with interfacing some external DJ deck controller with CAMD Midi framework but it does not work yet. This feature is a key point for such application. Even if mixing tracks can be done with mouse & keyboard, using an external controller really makes the job easier. Stay tuned! Quite some time since the last update here. Here is a screenshot of my current pet project. 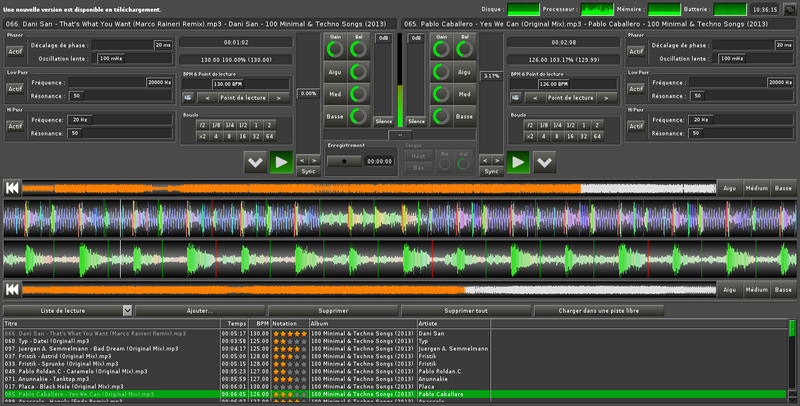 This application is already able to mix two streams with the help of the native multimedia framework of MorphOS: Reggae. I successfully mixed many tracks already with perfect tempo match. Current state is too rough for a release. If you're interested with testing the application, drop me an email! Thanks to BatteMan bug report, HotCorner wasn't working with touchpad events. This release addresses this very point. HotCorner should play nice with touchpad. Important: HotBorder needs opaque window dragging set in IControl settings for proper functionning. Here is a quick fix for HotBorder. HotBorder wasn't effective when window dragging outside screen required qualifier key (control, shift or alt). This new version fixes HotBorder behaviour with qualifier key. Also, as stated above, HotBorder needs opaque window dragging set in IControl. No provisions are made for checking this setting as there is no global API for querying system settings yet (apart loading/parsing/hacking preference files which is out of question). If HotBorder had no effect with your system, this release might help. Notice #1: HotBorder works only without qualifier for moving window outside screen border. This will be fixed in next release. Notice #2: HotBorder works only with full content window dragging. This will be fixed in next release. HotBorder is HotCorner's brother. HotCorner used only 4 pixels and something had to be done for all those lonely pixels living around the screen borders. Based on the HotCorner principle (triggers something when mouse pointer hits a corner...), HotBorder takes advantages of most of the free pixels living in screen borders. HotBorder resizes and moves window. When mouse pointer hits a border and mouse button is released, the active window is immediatly moved and sized. Up to seven size/position are available. Each of those size/position is bound to a specific screen border area. Warning: HotBorder is somewhat hackish. Read documentation before use. Archive is as usual available in the download section. Archive hosting has been improved a bit. Download links always point to latest archive version and are version agnostic. Linking from other sites will always point to the latest and up to date archive file. Also, the site layout has been somewhat revisited. Download section is now table formated and is more readable. Anything worthy for you here? Then get me a beer! Thanks a lot for your support! binaryriot.org hosts many MorphOS software packages. Hosting is kindly provided by tokai.